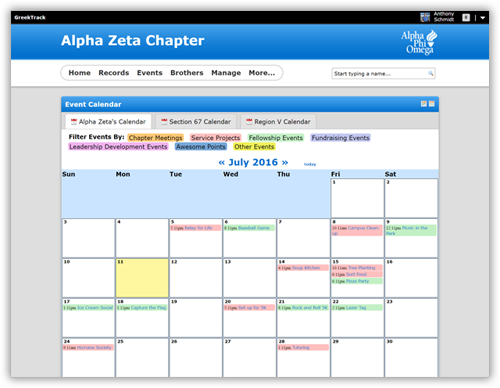 Manage your fraternity's or sorority’s events, membership, finances, and more with GreekTrack. You serve the community. We serve you. 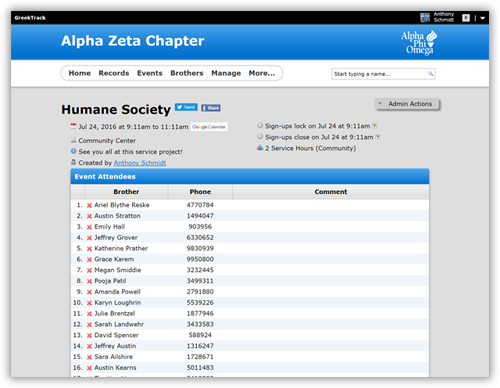 Create any event type, like service project for an example, and post them to your chapter’s calendar. Open registration for anyone, or hide it from pledges. Even require attendees to have a ride before they can sign up. Use SMS to keep everyone up to date. Each time you attend an event, your progress bars will grow. 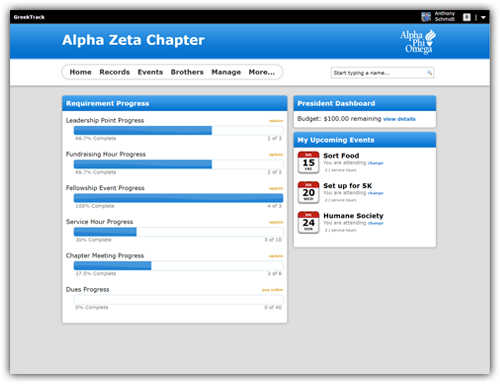 As an officer, easily generate a chapter progress report to see if everyone’s on track for their service requirement for example. Get more tools. Do more service. allowing you to focus on what’s important: doing service for your community. Host your files safely online and never fear about lost history ever again. Easily track who’s paid dues and collect dues online with GreekTrack Payments. Send mass SMS and Email messages to keep your chapter informed. All your chapter operations easily accessible anywhere, anytime. Visualize your family tree which is automatically generated for you. Keep a chapter photo album to share your passions to the world. Give awards to members and setup unique achievements to unlock. A little competition spices things up. See how you stack up. Show everyone on campus the great things your chapter is doing. Ensure that everyone can get to each event with ride management. Make your GreekTrack site your own with custom theming. Track every dollar coming in and out of your chapter making audits simple. Customize the membership statuses, officer positions, event types, chapter requirements, privileges, and more to make GreekTrack fit perfectly with your unique by-laws. 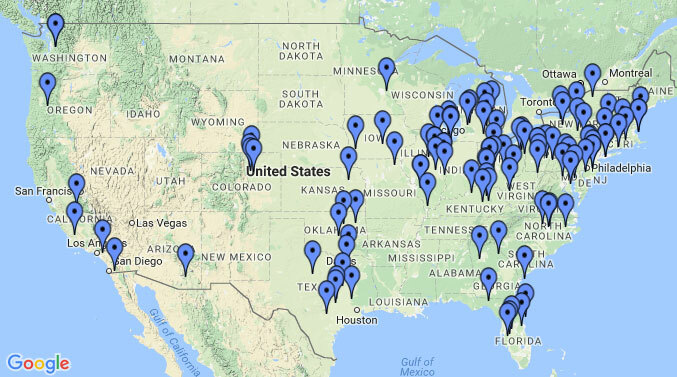 Hundreds of chapters coast to coast! 2.2 million hours of community service logged! Try it free for a semester! Includes all the internal tools you need to operate your chapter like an event calendar, progress reports, awards, family tree, etc. Includes Blue plus an external website for your chapter complete with editable webpages, photo albums, and chapter blog. Includes Gold plus tools to maintain a large organization like SMS texting and document storage. Your first semester of Diamond is on us! GreekTrack is an online chapter management service designed to assist fraternity and sorority chapters with managing membership, events, finances, and more.